Allows auto dealerships, motorsports facilities, classic car storage facilities, private garages, showrooms, and convention facilities to safely and conveniently transfer vehicles between levels. 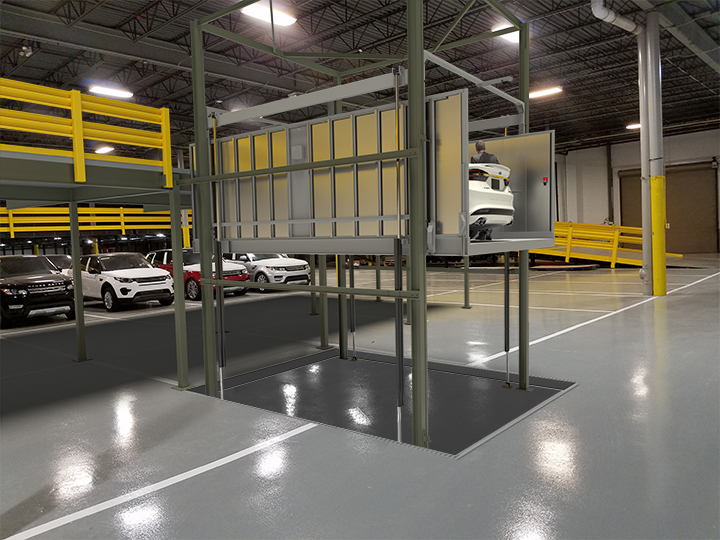 Waukesha, WI – March 2018, Wildeck, Inc. – Material handling equipment and safety products manufacturer, Wildeck, Inc., has introduced an affordable new rideable vehicle lift that allows authorized personnel to safely travel with their vehicle between levels. Until now, the only available solutions were to install an expensive freight elevator, or a VRC (Vertical Reciprocating Conveyor) that, according to Code, does not allow the person responsible for moving the car, to ride along with the vehicle to the next level. To catch up with the vehicle being moved, the person would need to separately send the vehicle, then traverse facility stairs to catch up and off-load the vehicle waiting at the upper or lower level. Wildeck’s new DriverLift™ eliminates that hassle and allows the person to stay with their vehicle. Now, who wouldn’t prefer that? Wildeck introduced its innovative DriverLift™ hydraulically-operated vehicle lift at the NADA (North American Automobile Association) trade show, in Wildeck Booth #4216C, March 23-25 at the Las Vegas Convention Center. According to Hubert Schlegel – Director of Marketing for Wildeck, “Wildeck’s DriverLift™ Rideable Vehicle Lift is an exciting new product that significantly increases the efficiency of vehicle transfer in automobile dealerships, motorsports facilities, classic car storage facilities, private garages, showrooms, and convention facilities. Customers can now enjoy the convenience of a freight elevator at a fraction of the cost. “We are extremely excited about the numerous potential applications for our new DriverLift™”, states Schlegel. 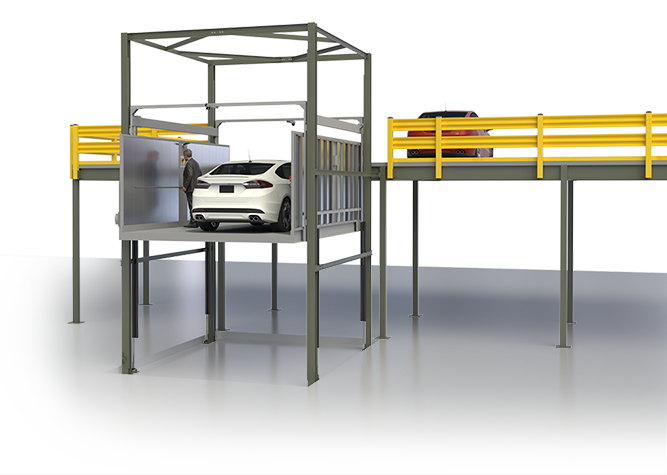 “The ability to ride between levels with their vehicle has been sought after by many customers and Wildeck is proud to be one of the first lift manufacturers to offer such an elegant and affordable solution. Wildeck, Inc. – headquartered in Waukesha, Wisc., with additional manufacturing operations in Goodyear, Ariz. – is a member of MHI (Material Handling Industry Association), MHEDA (Material Handling Equipment Distributors Association), FMA (Fabricators & Manufacturers Association, International), and the NAEC (National Association of Elevator Contractors). The company is the largest manufacturer of manual and automated vertical lifts (VRCs), rideable material lifts (RMLs), structural steel mezzanine platforms, and safety guarding products in North America. A complete line of industrial rolling ladders, custom-designed work platforms and other high access products are also available. Wildeck products improve supply chain productivity and provide additional capacity, efficiency and safety in automobile dealerships, manufacturing plants, warehouses, distribution centers, and many other facilities. They are sold through a dedicated and experienced network of customer-service-oriented dealers and systems integrators nationwide.